Hot Water Extraction, also known as shampoo cleaning, is one of the best cleaning methods out there to really deep clean your carpet. It combines hot water and specialized carpet cleaning products to loosen up the dirt from within the fibers of your carpet. They are both extracted carefully by a powerful vacuum that gets rid of all dirt and allergen. Inspect the carpet – We will do a walkthrough of your home to identify high traffic areas that will need a high mixture of cleaning agents. Mix the cleaning agent – We will prepare a mild or stronger solution depending on the condition of your carpet. Vacuum the carpet thoroughly– This basic step is fundamental. By removing all dry soil we will be preparing your carpet for better absorption of our cleaning agents. Spray the cleaning agent evenly– We don’t want to leave untreated spots in your carpet. We take our time to ensure a high-quality service. Leave cleaning agent for 5-10 minutes – Cleaning agent will do their job by infiltrating into your carpet’s fibers to loosen up dirt. Rake the carpet – In this step, our cleaning agents will travel down to the roots of your carpet’s fiber giving the carpet a deeper cleaning with ultimate results. 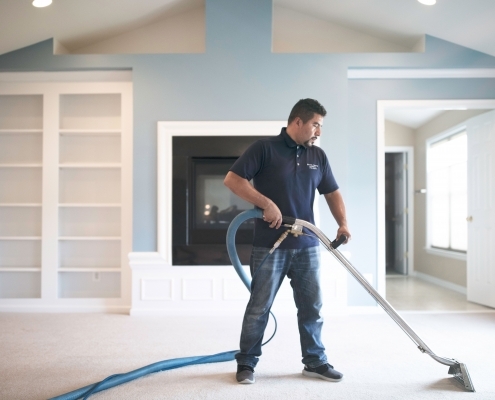 Extract – We ensure a high-quality extraction of all cleaning agents, allergens, and dirt, utilizing a high-quality vacuum that will rinse your carpet’s fiber with hot water. Deodorizer and protection – After your carpet is clean we will add our deodorizer and protection solution upon your request. These will keep your carpet clean and smelling fresh for a longer time, it is highly recommended. Time to dry – Carpet will take from 12-24 hrs to dry depending on ventilation.